A charming and light bay fronted terraced house with lots of character and good ceiling height, having been recently extended into the loft with additional bathroom added above existing rear addition. The double reception with nice stripped floorboards and fireplaces allows access to the garden. The current eat-in kitchen could be extended further over the side return area, subject to the usual consents. Three of the four bedrooms are generous doubles, and are served by two bathrooms. The house has good eaves storage space. It is ideally positioned for excellent primary schools being opposite Good Shepherd RCPS and Wendell Primary School is also close by. Gayford Road is an exceptionally quiet street running from Askew Road into Cobbold Road and is always popular due to its Victorian character and proximity to Wendell Park and to local shops and cafes on Askew Road. It is an approximate 10 minute walk to Stamford Brook (District Line tube), and 5 minutes from the 94 bus route east and west on Goldhawk Road, which gives ease of access to Westfield and The Central Line tube and mainline stations. The 266 bus route links Askew Road to Hammersmith Broadway in about a 5 minute journey. 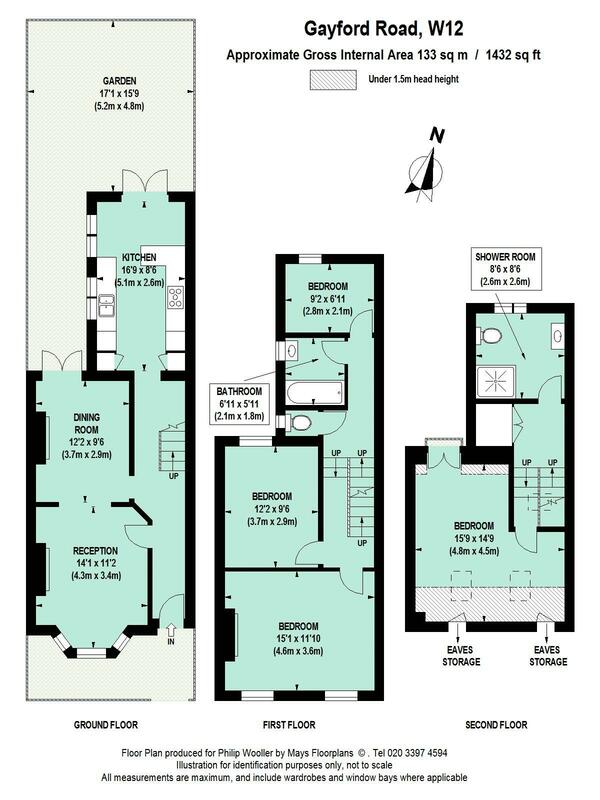 1432 sq ft / 133 sq m approx.